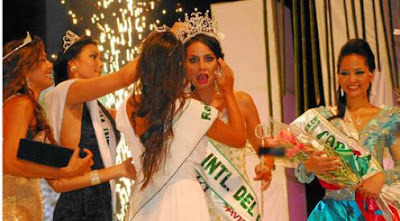 Miss Bolivia, Ximena Vargas Parada was crowned the very 1st international beauty queen of 2012 as she won the title of Reinado Internacional del Cafe 2012 also called as International Queen of Coffee 2012 beauty pageant which was held last January 8 in Manizales, Colombia. Ximena Vargas also won the Most Beautiful Face award. She was considered a pageant veteran and also competed in Miss International 2010. The 1st run-up was Miss Colombia, Yoselin Rincon. 2nd run-up was Miss Indonesia, Laskary Andaly. The 3rd run-up was Miss Venezuela, Gabriella Ferrari. And the 4th run-up was Miss Brazil, Aline Reis.